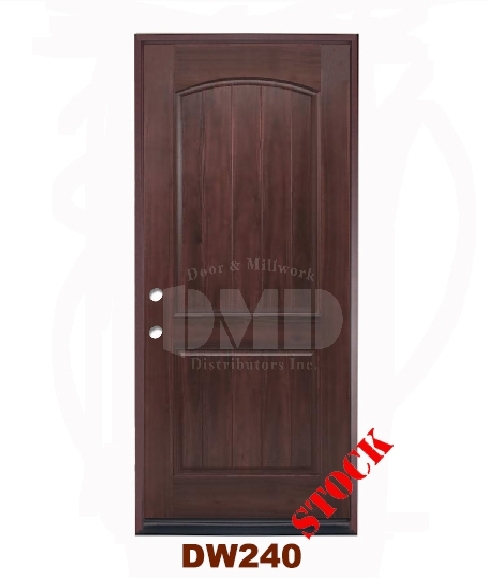 DW240 Dark Walnut Exterior Fiberglass Door - DMD Chicago | Door and Millwork Distributors Inc. Chicago wholesale resource for Interior , Exterior, Fire Rated Doors and Mouldings. DMD Doors new line of fiberglass doors gives you an elegant door style with the look of rich mahogany or dark walnut, made from environmentally friendly materials that hold up to weather and wear. These doors will give you the look of high-grade wood, with all of the durability of fiberglass. The fiberglass doors are prehung on composite jambs to ensure maintenance free lifetime operation and have the look and feel of a real wood front door. This new stock item is available to pick-up anytime at both locations.